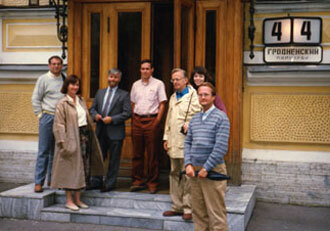 Dr. Uliana Gabara led a group of six faculty members on the inaugural Faculty Seminar to Yugoslavia, Poland, and the Soviet Union in the summer of 1989. The two-week trip was preceded by several weeks of personal research and on-campus presentations. While in Yugoslavia, Poland, and the Soviet Union, participants met with academics, intellectuals, and journalists. They also visited some of the region's most important cultural and political sites and were able to observe firsthand the dramatic changes and in some cases unrest that all three countries were experiencing during this time. The goal was to use the broadest possible set of approaches and contacts in order to "get the pulse of the place" and its history, and then to include it in teaching and research.